July – October: This is when the wildebeest are in the northern Serengeti plains, and you have a chance of seeing up to thousands crossing the great Mara River. As the sight of the wildebeest crossing the so dramatic, it is considered by many the most desirable time to see the migration. December – March: Currently the wildebeest are in the southern area of the Serengeti, more specifically in Ndutu which is actually in the Ngorongoro Conservation Area, and it is calving season. Along with the river crossings, this is a real highlight of the wildebeest’s journey and a fabulous time to see the herds congregate on the dramatic sweeping plains of the south. February is the only time of year when you are almost guaranteed to see the big herds all together as they always come south for calving season. The rest of the year: In November, April, May and June the migration is “in between” locations and as such these months are slightly transitional times to see the herds. November is the short rains, April and May are the long rains and as such the grass is green in these months across the Serengeti, so the wildebeest are more dispersed than in the prime time of July – October and December – March. Thus, you don’t get as many of those condensed big herds which people get excited about! Although we try to be as comprehensive as possible, something that is quite difficult to express on paper is a lot easier to explain over the phone, so please do just give us a call for a simple overview of the Migration's route. Wildebeest facts: Why does the Great Migration occur & why do the Wildebeest Migrate? The wildebeest migrate around the Serengeti, and into the Masai Mara for the sole purpose of following the rainfall. For their calving from December - March they always begin their cycle in the Southern Serengeti area of Ndutu and follow wherever the grass is greener... Whilst we have a good idea of where the wildebeest should be at any given time of year, it really does depend on where the rain falls. The wildebeest are notoriously unreliable, as although they generally all head from south to north Serengeti and back around again, they often zig-zag along the way, making it sometimes impossible to predict where the big herds will be at any given time. When does the Great Wildebeest Migration happen in Tanzania and when is the wildebeest migration in the Masai Mara, Kenya? Throughout the entire year, the wildebeest herds are always in Tanzania. For a short time of the year some of the herds are in Kenya. This time period is from July – October when the wildebeest are always crossing the Mara River in Tanzania between Kogatende and the Lamai wedge (the land between the Mara River and the border to Kenya). The herds are sometimes crossing the Mara river from one side of the Masai Mara to the other (all in Kenya). So the famous river crossings are most likely to be seen in Tanzania. Tanzania also has far fewer tourists on any one crossing, so we would always recommend basing yourself in northern Serengeti as opposed to the Masai Mara to catch the wildebeest crossing the Mara River. 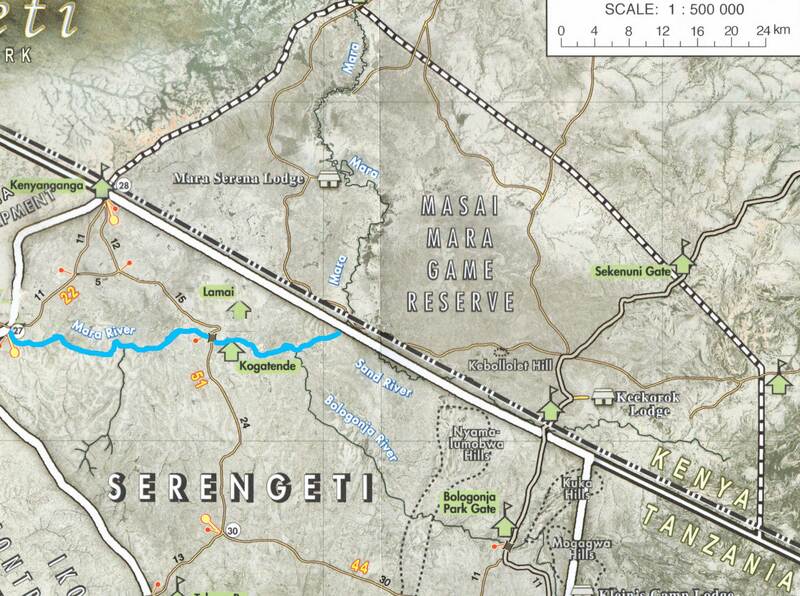 Please see our migration map of the Tanzania/Kenya border and where the Mara River cuts through each country. The popular misconception is that the river acts as a border of the two countries, but as you can see this is not the case! Instead of crossing the river from Tanzania into Kenya, the wildebeest only ever cross in between Kogatende and the Lamai Wedge (Tanzania to Tanzania), or in Kenya from the Masai Mara into the Masai Mara (Kenya to Kenya). If you would like to safari at the heart of the Great Migration of wildebeest and zebra, the best approach is to book one of the Serengeti's famous mobile camps. The mobile camps are erected at set locations throughout the year, and often move either two or three times a year depending on where the herds usually are at that particular time. Two mobile camps in particular set themselves apart from the others for their commitment to keeping up with the herds - Nomad Tanzania's Serengeti Safari Camp and &Beyond's Serengeti Under Canvas. These are the two mobile operations which we consider truly mobile and will be located near or amongst the herds at any time of the year as they move to more than two locations (which is the standard route of most the other mobile camps). That brings us to the mobile camps of Alex Walker's Serian, Asilia's Olakira, Ubuntu and Kimondo which move twice a year and offer superb mobile operations from July to November, and from December through to March. For the rest of the year these fabulous camps are closed. If going mobile is a little too adventurous for you, then the Serengeti has various permanent lodges that will offer all the creature comforts you need together with a good location to see the herds on your Tanzania safari. Here is an overview of the movement of the herds, and the best permanent lodges to stay at for each time of year. The Southern Serengeti's huge grass plains extend into the Ngorongoro Conservation Area. From December to March the Serengeti Migration congregates in large herds around Lake Ndutu in the Ngorongoro Conservation Area. When it reaches the area the herd splits up and spreads out leaving wildebeest herds as far as the eye can see. Ndutu Lodge and Kusini are the only permanent lodges in the area; Kusini is best towards the end of the period whereas Ndutu Lodge works throughout. Asilia's Dunia Camp is also a good option at the beginning of December and again when the herds push north in March. See our month-by-month blog posts; December, January, February, March for further details. This is rainy season in Tanzania. The Wildebeest migration moves north into the plains of the southern Serengeti with front runners stretching out to the Western Corridor and centre of the park at Seronera. Asilia's Dunia Camp is a great option at this time as are any of the central Serengeti hotels such as the Serena or Sopa. Early herds may well have pushed up to the Grumeti River Camp, Kirawira and Mbalageti Lodge area of the Western Corridor. See our month-by-month blog posts, April and May for further details. June is mating season for the herds, so can be very noisy if you catch many together. By June there are wildebeest herds spread from the Western corridor through the heart of the park. One group tends to head West into the Western Corridor and crosses the Grumeti River before leaving the park and entering the exclusive Singita Grumeti Reserves. This herd will then head up through the Ikorongo game reserve on the Serengeti's Western corridor before the front runners arrive into the Kogatende area in July. The other herds head directly to the north of the Serengeti, passing straight up the middle through Seronera, Lobo and up to the Bologonja river area near the Eastern border with the Loliondo reserve at Kleins. It is true to say that at this time herds can be anywhere from the Western corridor through to the Eastern side of the park. Splinter herds will break from the main herds, covering huge areas in their search for fresh grasses. We would recommend Grumeti River Camp, Faru Faru, Sasakwa, Sabora, Mbalageti Lodge and Kirawira for the Western corridor, whereas some herds will have pushed up as far as Migration camp in the Northern Lobo area. Late July will see any of the Kogatende permanent lodges having good herds, Serengeti Lamai and Sayari Camp being the places to go towards the end of July. See our month-by-month blog posts, June and July for further details. From August through to October the herds are in the Northern Serengeti at Kogatende as well as in Kenya’s Masai Mara. River crossings often happen daily here. With only a fraction of the visitor numbers that flock to the Mara, Kogatende is an exceptional destination. Given that the herds are simply following local rainfall, some move north, some move south… and many move in both directions in the same day. The sprawling mass moves in a circular fashion throughout these months – and as a result this is a fantastic time of year to see the herds. People who do not aware of the specific movements of the Migration often make the mistake of assuming the herds head north from June, cross into Kenya and stay there until October, only returning in November when the pastures are all grazed. This would be a logical thought, but it is simply not the reality! You will see at the river crossings, they may cross over, then suddenly cross back the other way – it is not a structured single mass movement but a series of hectic snap decisions “to cross or not to cross”! If one wildebeest takes the leap of faith, many may cross too, and similarly if one decides to turn back and cross over again, many will most likely follow suit; there may be 10 which decide to cross or 10,000. This means that there are excellent opportunities to see a crossing in Tanzania due to the amount of different crossings (and various crossing points along the Mara River), and due to the fact that they are always in the northern Serengeti from July – October (as opposed to them only sometimes being in the Masai Mara at this time!). See our month-by-month blog posts; August, September and October for further details. By the beginning of December, the herds are returning to Ndutu to calve, and the whole process is ready to start all over again. We must reiterate….wildebeest are not the most predictable of animals! The Migration is also entirely dependent upon rain, with the herds constantly searching for fresh grasses. As a result, it is a challenge to predict with any confidence where the herds will be during any particular week, and therefore to decide where best to stay. Choosing a permanent camp or mobile camp for your Tanzania safari that is located in the 'right' area for the time of year will clearly increase your chances, but there are no guarantees. See our blog post about the migration in November for further details. Crossing point 8. A dramatic crossing for this big herd – demonstrating how sometimes going to see the migration out of the peak season of July – August can be a very good idea, as you miss the crowds, get some great deals at some of our favourite lodges yet still witness this spectacular migration action. Crossing point 4. The dust kicking back from the wildebeest demonstrates the harsh climate which the wildebeest are up against at the very end of the dry season. Crossing point 3. A long stretch of water for the wildebeest here – real rush hour chaos on the Mara River. Wait for the baby wildebeest at 1.45 who makes a true leap of faith! Crossing point 2. This video demonstrates the uncertainly of the wildebeest, and how you can sometimes be waiting at a crossing point for a few hours before one decides to go, and the others follow! Once they go though, they really do go. The Great Migration - Where are the wildebeest right now? For further reading on the Great Migration, a good place to go is our month-by-month blog which goes into detail about exactly where we think the migration will be at each time of year. If you are still not sure what the migration is all about, a member of our team, Kitty has written a post on her personal blog which clears up misconceptions and is about as detailed as they come. The migration undertaken by the wildebeest is an annual event which sees one and a half million wildebeest accompanied by hundreds of thousands of zebras and numerous other antelope species as they search for pastures greener. The animals follow a clockwise movement through the Serengeti following the rains for the lushest of grass. The five hundred kilometres is fraught with danger with many predators such as lions, cheetahs and crocodiles preying on the animals. It is a truly amazing spectacle. Although we do our best to be as informative as possible, it really always is best to give us a call and chat to an expert who can give you the low-down on where the wildebeest are right now.